Hypodontia: A Team Approach to Management provides specialist clinicians with a practical reference to the multidisciplinary management of patients with this condition. The book synthesises current information and best practice from specialties involved in the treatment of hypodontia into one comprehensive volume, emphasising a problem-based approach throughout. This volume is structured over three sections. Part One offers background information on the epidemiology and aetiology of hypodontia, its inheritance patterns and syndromic associations, as well as describing the clinical features of the condition and outlining the importance of a multidisciplinary approach to patient care. Part Two addresses key issues in hypodontia management, namely challenges posed by excessive or inadequate space within and between the dental arches, specific occlusal considerations, and problems related to the supporting tissues. Part Three considers treatment of hypodontia within the framework of three broad stages of dental development: the primary/early fixed dentition, the late mixed dentition/early permanent dentition, and finally the established dentition. 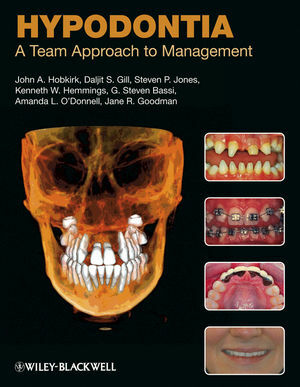 Hypodontia: A Team Approach to Management draws on the best available evidence and opinion to provide a complete, in-depth practical resource for dental specialists dealing with this complex condition. Prof. J A Hobkirk, DrMed HC, PhD, BDS, FDSRCS Edin, FDSRCS Eng, CSci, MIPEM. Emeritus Professor of Prosthetic Dentistry, University College London. Honorary Consultant in Restorative Dentistry. Mr D Gill, BSc, BDS, MSc, MOrth, FDSRCS Eng, FDS (Orth) RCS Eng. Consultant Orthodontist and Honorary Clinical Teacher. Miss J R Goodman, BDS, FDSRCS Edin, FDSRCS Eng, FRCPH, FHKCDS. Consultant in Paediatric Dentistry and Honorary Senior Lecturer. Mr S P Jones, MSc, BDS, LDS RCS Eng, FDS RCS Edin, FDS RCPS Glasg, FDSRCS Eng, MOrth RCS Eng, DOrth RCS Eng. Consultant Orthodontist and Honorary Senior Lecturer. Mr K W Hemmings, BDS, DRD RCS Edin, MRD RCS Edin, FDS RCS Eng. Consultant in Restorative Dentistry and Honorary Senior Lecturer. Mr G S Bassi, M DentSc, BDS, LDSRCS Eng, FDS (Rest Dent) RCPS Glasg, FDSRCS Edin. Consultant in Restorative Dentistry and Honorary Clinical Teacher. 1 Definitions, Prevalence and Aetiology. Part 3: Age-Related Approaches to Treatment. 8 Late Mixed and Early Permanent Dentition. 9 Established Dentition with Hypodontia.